Many games in our rosters had been enjoying the rise of in-game currencies price in October due to their newest updates last month. Although Halloween events were held in many games, their impact on the RMT market wasn't that significant comparing to the game updates. World of Warcraft, on the other hand, had a major price decline despite the upcoming Blizzcon 2016 in a few weeks. 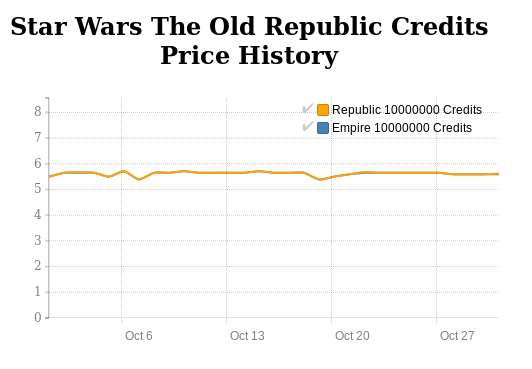 Star Wars the Old Republic Credits price was very stable for the whole month which was completely opposite to Tera Gold price. Ebondrake Citadel update was finally live on October 5, 2016, bringing a brand new end-game dungeon, including 4 and 6 members, to Blade and Soul. In addition, the long awaiting spectator mode was added to 1v1 PvP arena with the new tournament, Rumble in the Realm and competitive play update. Several Halloween were included to the game as well. These activities caused Blade and Soul Gold to keep their price after the rise since early September. The new end-game dungeon and PvP system should keep BnS in-game currency in this range for a while until it starts to drop again in mid-November. The cheapest was on October 19, 2016, which is 100 Blade and Soul Gold for $8.99 and the most expensive was on October 6, 2016, for $9.93. It is only 10.46% different. Although several updates related to the upcoming Star Wars the Old Republic update, including a cinematic trailer, were released in October, SWTOR credits price was unchanging at all. It was still staying stably in the range of $5.39 USD per 10mn credits throughout the month. The in-game currency price actually did not change since early September. “Knights of the Eternal Throne” is going to release on December 2 and available without any extra cost for all current SWTOR subscribers. It brings a total new progression to the game as well as several new contents. Because of the current game popularity, the update should not create a significant impact on RMT price. The cheapest was on October 19, 2016, which is 10mn SWTOR US Credits for $5.39 and the most expensive was on October 1, 2016, for $5.65. It was only 4.82$ different. 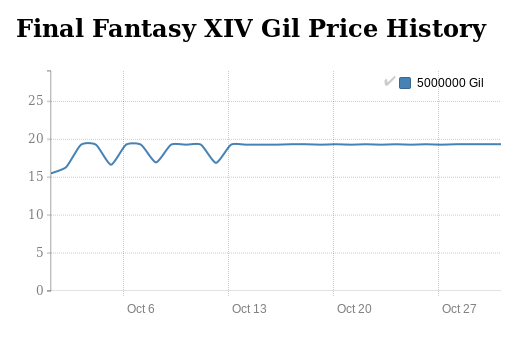 On the whole opposite site of Star Wars the Old Republic price, Tera Gold had greatly fluctuated since September. The price regularly went up and down at the rate of $25.16 and $27.12 per 20,000 Tera Gold. Tera marketing strategy was still heavily relied on cute costumes from the in-game store. On the other hand, the new “Spellbound” updates adding two new dungeons to the game did not create any effect on its RMT price at all. Tera Gold price in November should not be different than in October but the average price is expected to be slightly lower. The cheapest was on October 14, 2016, which is 20,000 Tera Gold for $25.16 and the most expensive was on October 30, 2016, for $27.74. Although it had only 10.25% different, Tera gold price had been changing for the whole month. World of Warcraft Gold price took an additional surprise this month. Instead of the rising in in-game currency price at the end of the month due to the upcoming Blizzcon 2016 and WoW Arena World Championship, it took around 30% decline a week before the event. October was a busy month for Blizzard due to several events related to the Blizzcon, including e-sport championship for various Blizzard games. World of Warcraft, the same way, released many events for the Blizzcon. In addition, Patch 7.1, Return to Karazhan, was released in the middle of the month but did not have any impact on RMT price. 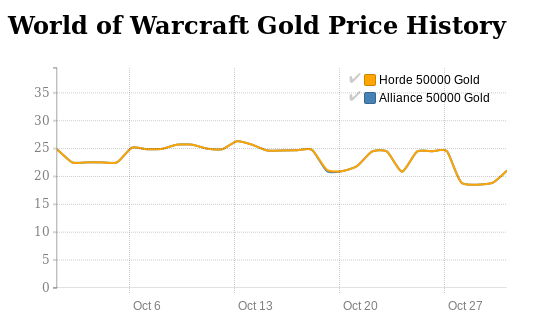 It was quite hard to expect World of Warcraft Gold price in November but it tends to rise slightly.